Another week, another dead modular green roof. This was probably the worst we’ve seen. 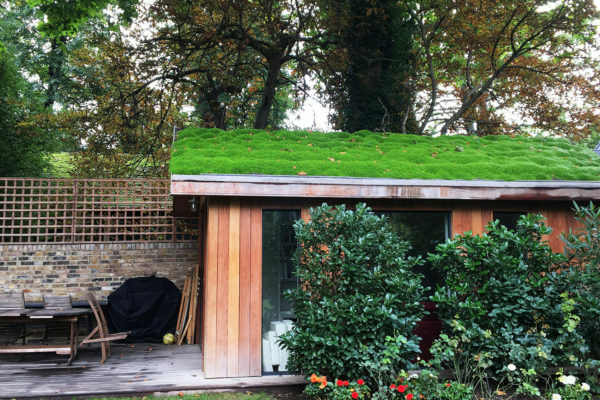 We were called in by a garden and landscape design consultant to diagnose what had gone wrong with this modular roof in west London, which had no plant life surviving at all, and was a significant blot on an otherwise beautifully tended garden. In the first stage we removed the modules and set about rectifying the poor waterproofing we found underneath, the client having decided that they didn’t want to go to the expense of replacing that part too. 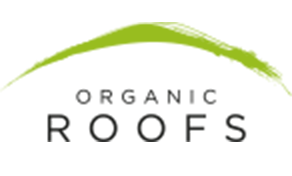 Having cleaned and prepared the roof as best we could we then constructed an anti-subsidence frame to hold everything in place and filled with a very good quality growing medium (we only use one trusted supplier) to a depth of around 120mm. 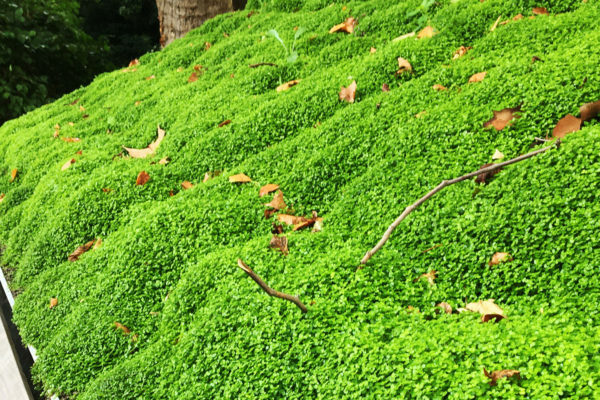 The garden designer, Maitanne Hunt, had worked previously to beautiful effect with Soleirolia soleirolii (Mind Your Own Business) as a carpet-like ground cover in the exaggerated spaces between granite paving in a Japanese-inspired garden (also in west London). Adapting the plug and plant method, we used almost two hundred plants to create the basis for growing-on of a full-cover roof. Within a month or so the plants, irrigated once a day, were obviously flourishing and the gaps starting to fill. Within 3 months the cover was almost 100% and rather than being an ugly blemish, the roof became an almost iridescent focal point in the large rear garden. Although we prefer not to specify roofs with irrigation wherever possible – and one of our side project is to develop a solar powered rainwater crisis irrigation system there really is a place for innovative approaches to ornamental planting at roof level and we can’t wait for another opportunity to arise to work with this gorgeous plant again. We had a slightly challenging roof which was under a large canopy with no sun or rain. 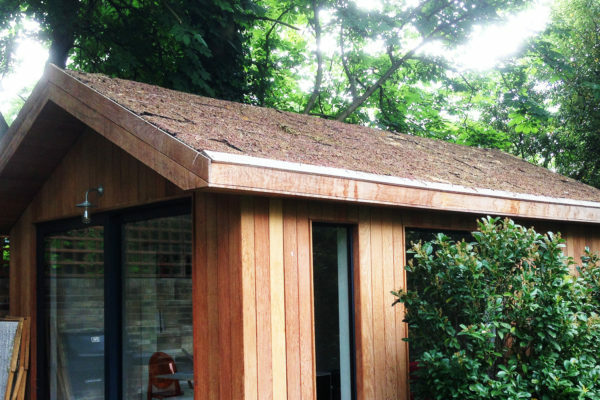 The home owner had previously tried to install a sedum roof, which had simply disappeared. 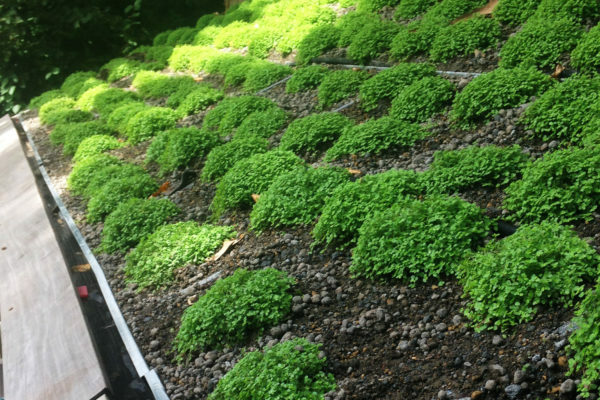 With Organic Roofs' help, we proposed a different planting solution with shade-loving ground cover. The result speaks for itself.